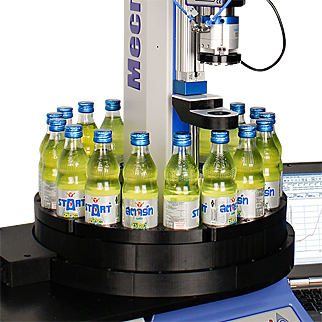 The Mecmesin ABC-t Automated Bottle Closue Tester measures both slip and bridge torques on a range of Roll on Pilfer Proof (ROPP) closures, with all test results stored and exportable to peripheral devices, spreadsheets and SPC packages. Mecmesin is a long-established provider of digital closure testing instruments and systems. In response to requests from our users, and using our acknowledged design experience, we have created the ABC-t automated closure tester. This offer the immediate benefits of greatly increased test throughtput, and elimination of repetitive strain injury by operators twisting many closures. 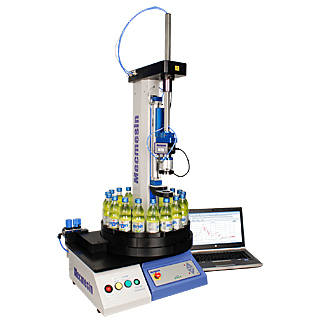 All sample positioning and testing movements are programmed and pneumatically controlled. Test control and results analysis are performed by Mecmesin's proven Emperor™ software.